You've heard him on WGBH, now's your chance to meet him in person! 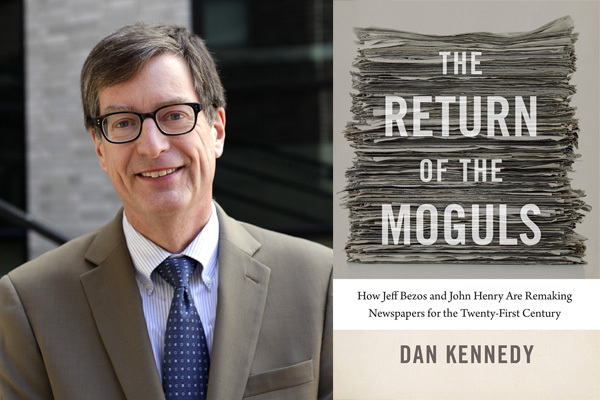 Dan Kennedy will be at An Unlikely Story to discuss and sign his new book, THE RETURN OF THE MOGULS: How Jeff Bezos and John Henry Are Remaking Newspapers for the Twenty-First Century. The newspaper business is at a perilous crossroads. This essential book explains why, and how today’s new crop of media moguls might help it to survive. It's sure to be a thought-provoking event with a lively Q & A period. We'll be serving beer & wine with light snacks during the event. The Return of the Moguls chronicles an important story in the making, one that will affect more than just the newspaper business—it has the power to change democracy as we know it. Over the course of a generation, the story of the daily newspaper has been an unchecked slide from record profitability and readership to plummeting profits, increasing irrelevance, and inevitable obsolescence. The forces killing major dailies, alternative weeklies, and small-town shoppers are well understood—or seem obvious in hindsight, at least—and the catalog of publications that have gone under reads like a who’s who of American journalism. During the past half-century, old-style press barons gave way to a cabal of corporate interests unable or unwilling to invest in the future even as technological change was destroying their core business. The Taylor family sold the Boston Globe to the New York Times Company in 1993 for a cool $1.1 billion. Twenty years later, the Times Company resold it for just $70 million. The unexpected twist to the story, however, is not what they sold it for but who they sold it to: John Henry, the principal owner of the Boston Red Sox. Though Bezos and Henry are the two most prominent individuals to enter the newspaper business, a third preceded them. Aaron Kushner, a greeting-card executive, acquired California’s Orange County Register in July 2012 and then pursued an audacious agenda, expanding coverage and hiring journalists in an era when nearly all other newspaper owners were trying to avoid cutting both. Dan Kennedy is an associate professor in the School of Journalism at Northeastern University in Boston and a panelist on WGBH-TV’s Beat the Press. He was a reporter and media analyst at the Boston Phoenix for eleven years and a featured media columnist for the Guardian for five years. He writes on the news media for WGBHNews.org, the Nieman Journalism Lab, and other publications, as well as the blog Media Nation. He is the author of The Wired City.